I love finding Etsy artists to become obsessed with. I always stalk take a look at their shops and blogs and ponder whether or not I should purchase ANOTHER piece of artwork for my home. I have been trying to discover my own painting style, and when thinking about what I have always enjoyed painting, I recently realized that it is NOT what I am painting right now. I love painting loose and messy, so I am trying to finish my current commitments before I start my new paintings that will hopefully work out. One inspiration could definitely be this girl...I am not a people painter, so I really admire those artists who can paint people so beautifully. I absolutely LOVE the colors, blending, and organic feel of Bella and Bunny's prints. I also noticed that she is currently having a sale...hmmmm....mom after seeing all of my stuff this month what do you think? 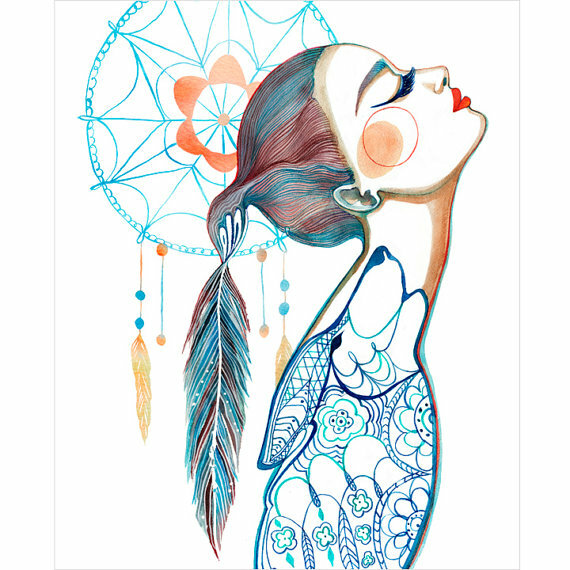 I am particularly in love with the dream catcher print...wouldn't it be cool over a little girl's bed (in reference to the old dream catchers from back in the day)...I know I have no kids yet, but I am a planner ;)! Everyone feel free to leave me a comment or e-mail me giving me permission to buy this print! Oh, and to get the sale items, look for the thumbnails at the of her shop that say 20% off; you have to purchase that and tell her the print you want to get the sale. Can I be Business Savvy?